Once we get past the major peripheral presidential campaign issues currently dominating social and left and right wing media, there are three subjects that deserve our careful attention: Immigration, Trade, and Health Care Legislation. The focus of this post is immigration. First, let us admit that we have committed terrible sins looking the other way as immigrants flocked to the USA without being forced to check in and identify themselves. We did that because we have enjoyed their cheap labor harvesting our crops and building our homes and caring for our lawns and children. We are now paying the price as we risk dangerous immigrants crossing leaky borders and argue over what to do about those potential good citizens currently under the radar and in violation of the law. It is a sorry history and a bad situation. I suggest that any discussion of policy changes should be based on some understanding of the history of immigration to the USA and of legislation directed at it. After all, even the ancestors of so-called full-blooded Native Americans are believed to have immigrated here eons ago. Here is a quick summary of legislation mileposts. It is interesting to think about motivation for some of the changes. There are a couple of more extensive histories here and here, sometimes including comments on the reasons behind the legislation. 1882 – Chinese immigration curbed; Also lunatics, idiots, persons likely to become public charges; $0.50 tax on new arrivals. And here is a nice chart of total immigrants by decade. This is legal immigrants only. It is available here. I have written earlier about walls and bridges, both of which I believe we need. Whether the walls are physical or electronic, we need some way to restore the integrity of our borders while at the same time allowing and encouraging immigrants who will support our Constitution and Flag to sign up and come on in. If the goal is to change our way of life, send them back. Whether Mrs. Clinton has a terminal illness and is dying as we watch. Whether Mrs. Clinton should be in prison along with others who mishandled classified information. Whether Mrs. Clinton has granted access to individuals in return for money. Whether Mr. Trump is just building his brand and has no desire to be POTUS. Whether Mr. Trump’s ego will be the cause of our next global war. Whether Mr. Trump forgets from one day to the next what he has said. So far as I can tell at this point, only one of the six “whethers” has a clearly positive answer. 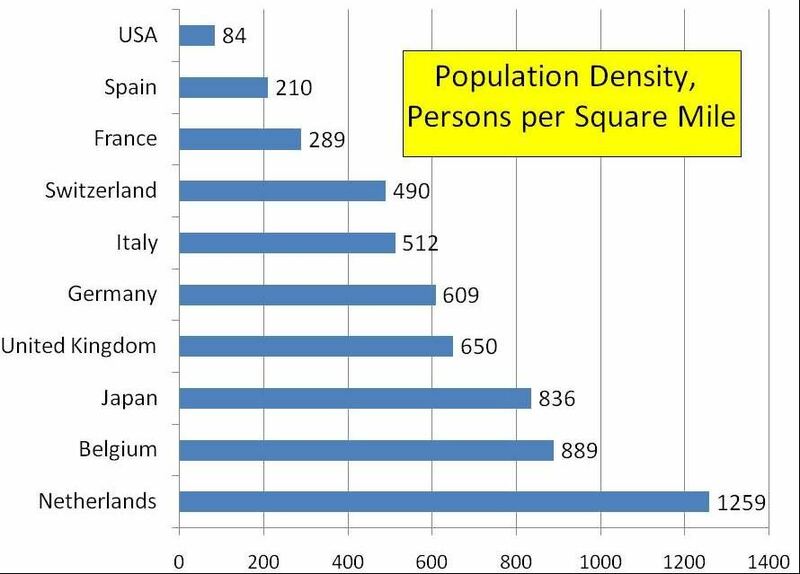 Note: I am adding this population density chart in response to the comment about immigration as a percent of population being still well below what it was at the previous peak. Which whether has a positive answer? Interesting graph. However, when considered as a function of the total US population, there was much more immigration in the periods 1850 – 59 and 1900 – 09. The dip after 1859 was probably a result of the Civil War and the significant decline after 1910 can be attributed to the two World Wars and the Great Depression. 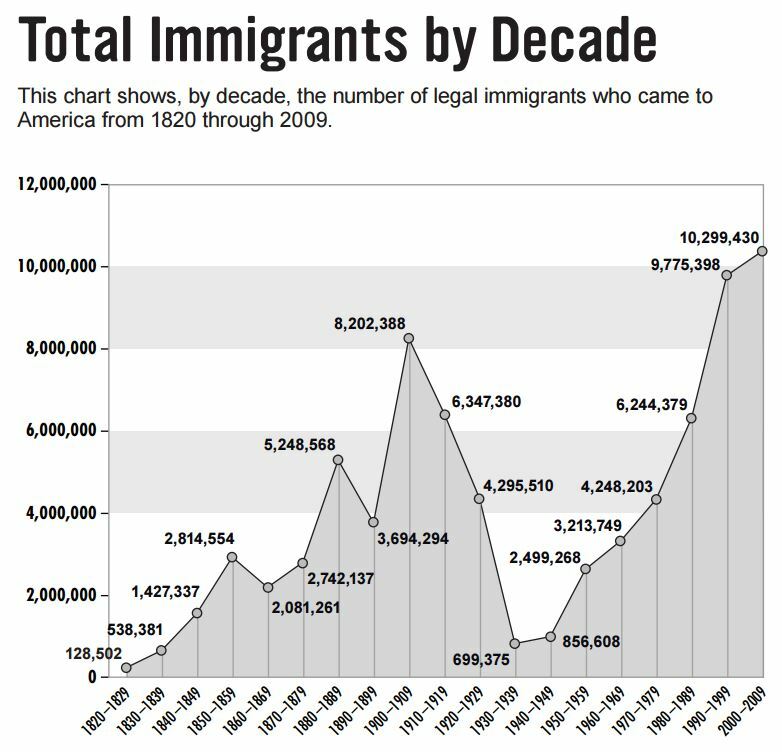 Since 1950 immigration has been increasing steadily; however, it still has a long way to go to reach the 1850 – 59 proportions. Absolutely. And our population density is still relatively small though some adjustment is needed for the percentages of land reasonable inhabitable. I added the population density chart to the post since I can’t seem to put it in a comment. It was in the 1960s when the worry about over population first got a lot of attention. All were told of a need to limit the number of children and European descendants in Europe and North America seem to be the only ones that limited the number of children – and China should be included. But others, notably Africa and the middle East, continue to average 6 or more per female. In 1960 the US population was about 175M and now it is double that at about 350M. Growth has been from immigration of non-Europeans and large non-European families. Now we are told that we need immigration to continue growth of US population because the birth rate is too low to maintain our population. Historically, immigration to the US hs been mostly from Europe. But for the past several years immigration has been from other countries.